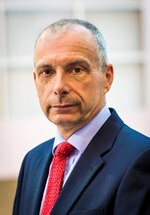 Prof Nick Linker BSc MD FRCP FESC FACC FHRS, is a Consultant Cardiologist at James Cook University Hospital, Middlesbrough and was elected Honorary Secretary of the British Cardiovascular Society (BCS) in 2016, taking up office in June 2017 for a three year term. Prof Linker trained in Manchester and St George's Hospital, London. He was appointed Consultant Cardiologist with an interest in cardiac electrophysiology at James Cook University Hospital, Middlesbrough in 1998. He was cardiology Training Programme Director for the Northern Deanery (2001 - 2005) and RCP Regional Advisor (Training) (2006 - 2011). He developed an MSc in cardiac care with the University of Teesside and was appointed as a visiting Professor in the School of Health and Social Care in 2014. He was Chair of the NE Cardiovascular Network CRM Group (2010 - 2014). He was appointed in 2016 to represent NHS North on the Cardiothoracic Clinical Reference Group. Prof Linker has been a member of the British Heart Rhythm Society (BHRS) Council since 2005, serving as Secretary from 2011 - 2014 and President from 2014 - 2017. During his time on BHRS Council he has redesigned the BHRS Certification process including gaining Masters' level credits; he has been integral in developing standards for implantable cardiac devices, electrophysiology and lead extraction. With Council, he has developed guidelines on MR scanning in patients with cardiac devices, peri-operative management of cardiac devices and end of life care pathways for cardiac device patients. He was a member of the Community Resuscitation Steering Group which developed the "Resuscitation to Recovery" guideline and also produced guidelines on out of hours services for cardiac rhythm emergencies. He has been co-chair of the BHRS Audit Committee, responsible, with his colleagues, for the re-design of the CRM audit databases. He was programme director for Heart Rhythm Congress from 2006 to 2014, an annual international scientific meeting which is a joint venture between BHRS and the Arrhythmia Alliance. As President of BHRS, Prof Linker has been a member of the BCS Executive, Council and Board since 2014 and commenced his role as Honorary Secretary (Elect) in June 2016.